Custom Sportbike Concepts® in partnership with Stuntwars and Seminole Powersports, announced plans to build a fully customized Honda CBR1000RR to be auctioned at the end of 2008 with all proceeds going to Fisher House™ a private-public partnership that supports America's military in their time of need. Designed and built by Nick Anglada of Custom Sportbike Concepts® of Winter Garden, Fla, the Honda CBR1000RR was donated from Seminole Powersports and will be debuted at the 2008 Stuntwars event January 8 - 13, 2008 in Lakeland, FLA.
"This is a significant build for us because of the Fisher House™ involvement" commented Nick Anglada, president and owner of Custom Sportbike Concepts®. "For the past seven years CSC® has run the custom bike show at Stuntwars, so when the crew from Stuntwars approached us with the concept of the build it was a natural fit" continued Anglada. "Even more important, however, were plans to auction the bike to raise money for Fisher House™. Many of our customers are currently serving overseas, or have recently returned from service, and without our military, we would not enjoy the freedom that allows us to pursue our own interests, including motorcycling. Anything we can do to support our military is essential to our business." Best known for premier builds such as the 2006 Yamaha R1 "Juice" and most recently the L-R-G 2008 Hayabusa, CSC® will make a variety of external and internal modifications to the Honda, including a 240 Pirelli z-rated back tire kit, Carrozzeria wheels, Galfer rotors and lines, Vortex rearsets and gas cap, Berringer brakes, Jardine exhaust, Wicked Custom Coatings Powder Coating, Second Look custom seat, Isaac's Custom Painting and a variety of other aesthetic and performance enhancements. "We are extremely excited at the prospect of this build" noted Adam Chumita, Vice-President of Stuntwars. "For the past seven years Stuntwars has been the premier US stunt riding event, drawing thousands of enthusiasts and an elite group of competitors from across North America and overseas. The Honda CBR1000RR is intended to celebrate the success of Stuntwars, while giving something meaningful back to the community" explained Chumita. "Fisher House™ provides an essential service to military families with a loved one hospitalized because of sickness or injury. We are extremely supportive of this initiative, and we hope the auction will help us make a significant donation to this great organization." The CSC® / Stuntwars CBR1000RR will be featured in a variety of American and overseas magazines, and will be showcased at all major events attended by representative from Stuntwars in 2008, including Daytona Bike Week, Myrtle Beach Black Bike Week, Sturgis and Biketoberfest. The Honda will be auctioned on e-bay at the end of 2008. For more information, contact Nick Anglada of Custom Sportbike Concepts® at 888-924-7663 or visit www.CSCbikes.com. Founded in 1998, Custom Sportbike Concepts® is noted for producing some of the most ground-breaking builds in the aftermarket sportbike industry. Owned and operated by Nick Anglada, Custom Sportbike Concepts® retails a variety of aftermarket hardparts and accessories for sportbikes, as well as providing full service custom builds. 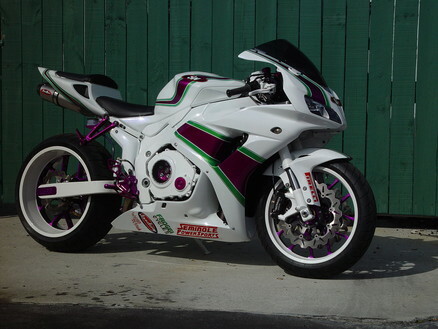 You can learn more about Custom Sportbike Concepts® at www.CSCbikes.com. Cofounded by Adam Chumita, Chris Nichols, and Todd Colbert in January 2003, Stuntwars is one of the largest sportbike stunt competitions in the world today, drawing 10,000 plus spectators to watch 125 top riders battle it out for the chance to walk away with the championship title. For more information, visit www.stuntwars.com.